If the game in Austin was the kickoff to the quest and the game targeted from the beginning, game #2 (really #3) at Northern Illinois was the game that made the quest real. A trip to Austin for a premiere football game can be justified by any football fan, a trip to DeKalb, Illinois for a Wednesday night football game in November is only for those who have lost a bet or are doing something insane like trying to see a game at all 120 Division I-A football schools. This is the game that said we have begun and we must finish otherwise we wasted a lot of time and money going to obscure places. Year 1 of the quest was hastily put together and not planned very well due to the last minute decision to undertake this quest. Therefore, a lot was planned last minute and this game was a last minute decision. Due to the late start in planning and on the calendar; we needed a mid week game so as to not push our luck with spouses with another weekend trip. So we went with a mid week game with an easy trip from New York. Northern Illinois was the spot with an easy in, easy out flight to Chicago. Even though this was game #2 on the quest, it was actually the third and last one planned for this year in a rapid attempt to get a third game in for year #1. Our flight from JFK to Chicago was uneventful. We picked up the rental car, checked into the hotel by the airport, and headed out on the drive from Chicago to DeKalb, IL. In what I hope will not be a common theme on these trips, Al reserved the hotel for the wrong day, creating an increase in expense for the hotel portion of the trip. We arrived in DeKalb and took a quick driving tour while trying to find the bookstore and a place to park. We eventually succeeded and while shopping at the bookstore, I found a postcard with an aerial view of the stadium within 2 minutes. This should be quite embarrassing for Texas, but I am sure I am the only one who cares. We continued to walk around the school. Al visited the press box at the Stadium as there was no security at the stadium in the middle of the afternoon. I guess there is not much wild tailgating early in the day for a Wednesday night game. Al forgot to bring a football and a clear opportunity to get on the field to kick field goals passed us by. On a more serious matter, in February 2008, a former NIU student shot and killed 5 people and injured 21 more in a lecture hall on campus. We tried to locate Cole Hall, the site of the shooting, to see a memorial or something marking the site. We were unable to find the building or a memorial. It appears as if the school has removed any identifiers from the building. May those who were killed in this incident rest in peace and a speedy recovery to those who were injured. 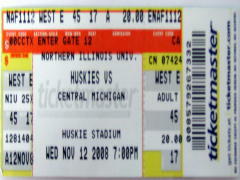 We purchased tickets at the NIU Convocation Center and proceeded to the game. BTW, I had never heard of a convocation center. I have no idea what it is or what its purpose is. It looks like an arena or stadium. Al thinks it is a building shell. 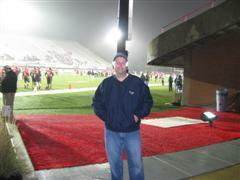 The weather at game time was 41 degrees and overcast. No matter what the temp was it felt much colder and wet as it was very foggy. I have decided that I am not cut out for cold weather games, which is going to be a problem as 41 is not that cold. Al actually separated his shoulder from shivering so much during this game. 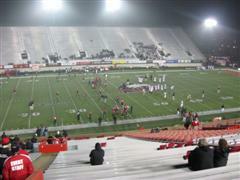 The concession stands had only hot chocolate (a very bad sign) and popcorn, so do not go the games at NIU hungry. But I will say that the stadium offered Al an excellent view into the cheerleader’s dressing room at halftime. 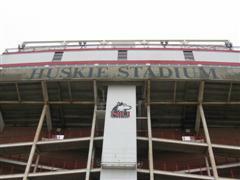 This is a big plus for NIU. Central Michigan came into the game 7-2 and undefeated in conference play and would play an undefeated and nationally ranked Ball State team the following week. 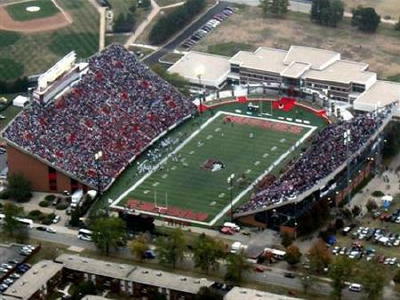 A Ball State team playing for a BCS bid. This turned out to be a very good football game as CMU jumped out to a 30-6 lead in the 3rd quarter. NIU battled back to force OT only to lose by throwing an INT on their OT possession. 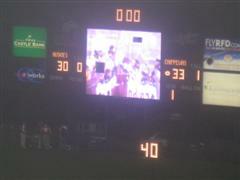 CMU then kicked the winning field goal to win 33-30. 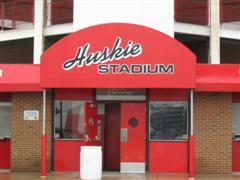 The stadium was reminiscent of a southern high school with the addition of a press box. 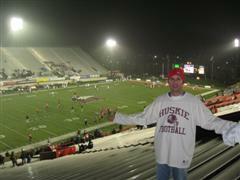 However, kudos must be given to the NIU student section which stood for the entire game, all 250 of them. I am not sure if they were into the game or just cold. Al thinks they were just smart and knew better than to sit on metal bleachers in the cold. We got back to the hotel in Chicago and despite the fact that the posted sign said the bar was open until 1:00am, it had already closed at 12:00am when we arrived back at the hotel. No drinks for us tonight. Thursday morning we awoke to simultaneous cell phones as our JetBlue flight home was cancelled. We scrambled and rushed to make the 9:30am flight. And why does it take JetBlue 2 hours 45 minutes to fly from Chicago to JFK ? Do they fly over Albuquerque ? > Al did not make one comment about boots. > Who is Annie Glidden and why does a major road named after her run right through campus? > Al thought the NIU band was better than Texas. This is based on his well accomplished musical background (lots of sarcasm here). His claim that he was in a marching band for 6 years means nothing to me. > Al thought the canon NIU fired after each score was blasting fireworks until the 3rd qtr when he saw one launched from the other side. The cold makes you stupid. > Al did not get to sit on a canon but if I had remembered we should have got him to sit on the canon when they fired it after scores. 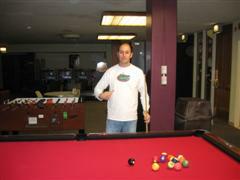 > Al wants me to write he is the better pool player. I have no issues admitting that. > Al had Chipotle for the first time and is a fan and has since gone again in New York. He should contact Chipotle for a sponsorship opportunity for the quest. On October 2, 2009 a memorial garden and sculpture was unveiled at Cole Hall. On January 14, 2011, a reconstruction began at Cole Hall. I know government works too slowly, but given that fact, this really should have been done a lot sooner. The fact that Al became a fan of Chipotle on this trip is now irrelevant, as I am currently (as of February 2011) boycotting Chipotle. I used to eat Chipotle 3 times a week for lunch, but due to an incident with a local Chipotle, their regional management, and their corporate management, I will no longer eat at Chipotle. I urge all of you to join me in the boycott of this company which lacks a basic understanding of customer service.